Living in a multi-cultural city yields all sorts of surprises. 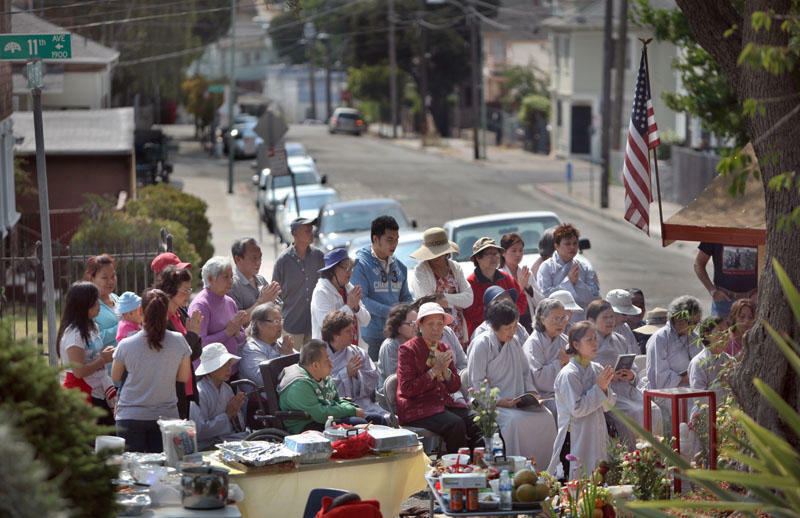 On a corner in Oakland just east of Lake Merritt, a small Buddha has helped bring neighbors together. I didn’t know what to think the first time I saw the makeshift Vietnamese shrine. At the time, a few potted plants and flowers brightened up the corner. A piece of scrap metal protected the statue’s head. I had just moved to the neighborhood. In this part of Oakland, deep potholes and trash mark the street. But then, there’s this perfectly manicured shrine. It’s an elaborate structure, decked out with flags, flowers and wall hangings. Vietnamese immigrants chant there every day. The clack, clack of a wooden stick that sometimes accompanies the chanting is not well received by all the neighbors. “The Buddhist alarm clock,” they call it. But they’re mostly tolerant, even appreciative. Because before the shrine, the corner was much worse. “There was a couple of years when there was just a lot of street muggings and a lot of car break-ins,” said Denise Mewbourne, my housemate. We live about half a block from the shrine. She’s been in the neighborhood for more than a decade. At one point, crime was pretty bad, she says, but it’s better now. She and others credit the Buddha. How that happened is a lesson in how history works. So many major and minor events bumping against each other — and reacting — to get us to where we are now. By one account, the story of the Buddha goes back to the the 1990s. Oakland installed medians to block streets and slow traffic. At the corner of 11th Avenue and 19th Street, that created a new problem: dumping. “Mattresses, tables, just junk, just continual junk, a lot of graffiti, a lot of urination and drug use kind of thing,” said Dan Stevenson, who lives catty-corner to the median. He called the city public works department a lot back then. Stevenson isn’t religious at all. He’s more of a cynic. But in 2009, inspiration struck. His wife Lu bought a Buddha at ACE Hardware. They thought maybe that would shift the energy. Concerned about vandals, Stevenson epoxied it to a rock on the corner. “I would have stuck Christ up there if he would have kept the mattresses off,” says Stevenson. “I don’t care who’s doing it. But then after about a year, other items started to show up. Flowers, oranges and small coins would appear and disappear. It perplexed Stevenson because he never saw anyone bringing or removing the stuff. He didn’t know it, but Vietnamese immigrants -- including a woman named Vina Vo -- had adopted the Buddha. Vo is a tiny woman, less than five feet tall. She grew up in a village called Quang Ngai. Her 28-year-old son Cuk Vo translated as she told me her story. As a young girl, she learned traditional Buddhist mantras from her grandmother. Every morning she would pray and walk to the temple with her grandmother. Vo’s family lived through the Vietnam War, and then in 1975, South Vietnam surrendered to the Communist north. Vina Vo was 17 years old. The Communists burnt down many homes in the village, including that of her family. Relatives were beaten and killed. The temple was destroyed. Her grandmother suggested that she should leave the country to find freedom. Part of that freedom included the freedom to practice her religion. In 1982, Vina, her husband and brother got on a small boat that held 34 people. During a storm, they nearly capsized, but were rescued by Chinese people, who took bribes for their safety. Eventually, they ended up in a Hong Kong refugee camp. It was a warehouse with bunkbeds and no privacy. There, a monk came to visit once a week. It had been 10 years since Vina recited the mantras her grandmother taught her. But in the camp, she gathered with about 40 people to pray. After seven years in the camp, the family received sponsorship from a family in Kentucky. They hopscotched around before arriving in Oakland. In 2010, someone at the Vietnamese church told Vina about the 11th Avenue Buddha. She started doing just that and friends and family helped. When he put out the Buddha, Dan Stevenson hadn’t viewed him as a religious artifact. But Buddhism is a religion. And the Buddha was sitting on city property. A neighbor complained. Oakland’s attitude towards religious expression is mostly to just let it be. But after that, the city wanted the Buddha gone. That didn’t sit well with Dan Stevenson, the original owner of the Buddha. He told the neighbors. People got riled up. They called and sent emails to City Councilwoman Pat Kernighan. So the city backed down. The shrine has always been beautiful. A spot of grace in a city that’s spotted by blight. In July, the grounds, the Buddha’s shelter and even his face got an upgrade with a paint job that left his hair black and garments gold. “He’s beautiful. I would never have recognized him on the street,” Stevenson says. But it is the same Buddha, and in the same spot, though he is attracting a bigger crowd. In a celebration over the summer, about 40 Vietnamese who came from all over Oakland donned grey robes. Like Vina Vo, many are refugees who fled their country in search of freedom. Thanh Ahlfenger is from the Vietnamese American Community Center of the East Bay. She says the 11th Avenue shrine mimics life in that part of the world. “Back in our country, in village, we always have, just like small shrine in every village, all different corners besides the official temple,” Fang said. In Vietnam, shrines and temples are community meeting places. Just as this shrine is in Oakland. Of course, there are people involved, which means there are disagreements about management. But it’s bringing people together, and not just the Vietnamese community. Often, I see people from all kinds of ethnic backgrounds stop to meditate or pay respects. On National Night Out, the shrine was the obvious meeting place for the neighborhood. As for Vina, she’s a familiar, friendly face on 11th Avenue, rigorous in her devotion. She believes the chants make you a better person. Caring for the Buddha is symbolic of caring for oneself. Or a neighborhood. “How about you? You like it over there?” Vina asked me about the shrine. Let me answer this way. There’s a Buddhist concept called Dependent Origination. Simply put, it’s the idea of cause and effect. You pick up a glass of ice water. Your hand feels the cold. One can’t happen without the other. Same with the 11th Avenue shrine. Its creation required crime, a man’s frustration, the Vietnam War, and the devotion of a small, determined woman to intersect in one space. Its impact is spreading. The shrine is inspiring my housemates and me to plant a garden in our front yard. We have a standard to live up to. For more stories and blogs from The Spiritual Edge, click here. It’s intense in a sweat lodge. You enter a round structure, about five feet high at the center, and sit down on the earthen floor. Then the flap of heavy blankets closes and you’re left in utter darkness. Moments later, the leader pours water over hot, volcanic rocks. Like a sauna, thick steam rises and spreads. I’m Jewish. I feel a strong affinity for Judaism – the beauty of its rituals, teachings and music. But it can be hard to relate. These days, a lot of people prefer the word “spirituality” over “religion”. Many people associate religion with dogma handed down by inflexible institutions that don’t keep up with the times.